Chess is game for two players, called White and Black. White always makes the first move to begin a game, and thereafter the players take turns moving. A turn may never be skipped. Chess is played on a square board of 8 rows (called ranks) and 8 columns (called files), giving 64 squares of alternating light and dark color, which are referred to as “light squares” and “dark squares”. Click here to learn more about chessboard geometry, and some useful terminology. Each player begins the game with 16 pieces which can move in defined directions (and in some instances, limited range) and can remove other pieces from the board. Each player starts the game with 8 pawns, 2 knights, 2 bishops, 2 rooks, 1 queen and 1 king. All pieces can capture opponent’s pieces by landing on the space they occupy. One player controls the white pieces and the other player controls the black pieces; the player that controls white is always the first player to move. In chess, when a king is directly threatened with capture by one or more of the opponent’s pieces, the player is said to be in check. When in check, only moves that can evade check, block check, or take the offending piece are permitted. The object of the game is to checkmate the opponent; this occurs when the opponent’s king is in check, and no move can be made that would prevent the king’s capture. A stalemate, which is a draw, occurs if a player’s king is not in check and no legal moves are available; A draw can also occur if there are insufficient pieces left on the board to produce a checkmate (for example, if only the two kings remain). Here are some common terms that are used to describe various aspects of a chessboard, and are common to the chess vocabulary. The “center” refers to the squares e4, d4, e5 and d5. These squares have particular importance in chess strategy. The surrounding ring of squares shown by the lighter shade of red are centrally-positioned and usually see a lot of action. These terms refer to the left (queenside) and right (kingside) halves of the chessboard. A diagonal is a straight line of squares of the same color that touch corner to corner. The diagram shows various diagonals and how they are named. Ranks are rows of squares on the chessboard that extend from left to right. The diagram shows the names and locations of the 8 ranks. Files are sequences of squares on a chessboard that extend from the top to the bottom. The diagram shows the eight files of the chessboard. To begin the game, the 32 chess pieces are placed on the board as shown in the diagram. This diagram uses the conventional symbols that are used for the pieces in printing. The rook is sometimes called castle. The word piece is often used to designate a chessman other than a pawn. Note how all of the pieces are set up on the row nearest the players; in front of them is a row of eight pawns. The king and queen go on the central squares of the first row. The traditional rule as to which goes where is “queen on her color”, meaning that the Black queen goes on the dark square, the white queen on the light square. The central pieces are flanked (going outwards) by bishops, knights, and rooks. The knight has a horse’s head. The tallest piece – the king – may have a cross or a knob at the top. The queen is the second tallest. She may have a crown with points. The pawn is the shortest piece. The bishop is intermediate in size and design between the queen and pawn. He may have a cleft in his side. The most numerous piece in the game of chess, the pawn is also the weakest because of its limited mobility. Each player starts the game with eight pawns, one on each square of the second rank (for White) or seventh rank (for Black). In algebraic notation the white pawns start on a2, b2, c2, …, h2, while the black pawns start on a7, b7, c7, …, h7. Pawns may be differentiated by the files in which they currently stand, for example one speaks of “white’s f-pawn”. It is also common to refer to a rook pawn, meaning any pawn on the a-file or h-file; a knight pawn (b- or g-files), a bishop pawn (c- or f-file), a queen’s pawn (on the d-file), and a king’s pawn (on the e-file). The pawn can move forward to the square in front of itself. A pawn on its starting square has the option of moving forward two squares. Unlike all the other pieces, pawns may not move backwards. Normally a pawn moves by advancing a single square, but the first time each pawn is moved from its initial position, it has the option to advance two squares. Pawns may not use the initial two-square advance to jump over an occupied square, or to capture. Unlike other pieces, the pawn does not capture in the same way as it moves. A pawn captures diagonally, one square forward and to the left or right. In the diagram below, the white pawn may capture either the black bishop on f5. Any piece directly in front of a pawn blocks its advance. A white and black pawn advancing on adjacent files will eventually meet diagonally, so that each attacks the other. In order to avoid situations where one pawn could evade capture by an adjacent enemy pawn by using a double jump, a special rule called en passant (French for “in passing”) exists. 1) a pawn may capture en passant an enemy pawn that has just made a double jump and that it could have captured had that pawn advanced only one square. 2) the en passant capture is allowed only as an immediate reply to the double jump. It may not be made at any later move. A pawn that advances all the way to the opposite side of the board (the opposing player’s first rank) is promoted to another piece of that player’s choice. The pawn is immediately (before the opposing player’s next move) replaced by a queen, rook, bishop, or knight of the same color, even if the original piece is on the board. Thus, you could have two queens, three rooks, etc. Promotion is often called “queening”, because in practical play the piece chosen is nearly always a queen. When some other piece is chosen it is known as underpromotion and the piece selected is usually a knight. This will typically be done only if this enables a forced mate, or to carry out a tactic, such as a knight fork. Most standard chess sets do not come with additional pieces, so the physical piece used to replace a promoted pawn is usually one that was previously captured. The choice of promotion, however is not limited to captured pieces. However unlikely, it is completely legal for one player to simultaneously have as many as ten knights or ten bishops or ten rooks or nine queens. When the correct piece is not available, some substitute is used: a second queen is often represented by inverting a previously captured rook. Each player begins the game with two bishops, one light-squared and one dark-squared, which initially occupy the squares between the king or queen and the knight. In algebraic notation the starting squares are c1 and f1 for White’s bishops, and c8 and f8 for Black’s bishops. The piece’s deep groove symbolizes a bishop’s mitre. The bishop can move any distance along an unobstructed diagonal line of squares. Placed in the center of an open board, the bishop attacks a maximum of 13 squares. Bishops cannot jump over other pieces. A bishop captures by occupying the square on which an enemy piece sits. The bishops may be distinguished according to which wing they begin on,i.e. the king’s bishop and queen’s bishop. The bishop’s uniqueness lies in the fact that its existence is completely monochromatic: a bishop may only move to squares of one color. Each players begins the game with one white or lightbishop and one black or dark. Each player begins the game with two knights on their first rank. In algebraic notation the white knights start on b1 and g1, while the black knights start on b8 and g8. In standard chess sets, the knight is depicted as having a horse’s head. The knight moves and captures alternately on white and black squares; each move may be described as L-shaped in any direction, where the long arm of the ‘L’ is 3 squares, and the short base of the L is 2 squares. The green crosses in the diagram above mark the eight possible moves of a centralized knight. Unlike other chess pieces, the knight may ‘jump’ over other pieces in its path directly to the destination square. Like the other pieces, it captures an enemy piece on its destination square. Most chess pieces are more powerful if placed near the center of the board, and this is especially true for a knight. A knight on the edge of the board attacks only four squares, and a knight in the corner only two. This diversity in mobility is highlighted in the diagram below. Moreover, it takes more moves for a decentralized knight to switch operations to the opposite side of the board than a decentralized bishop, rook, or queen. Knights function best as short-range pieces and thrive on close combat, even in cramped conditions. Knights are usually brought into play slightly sooner than bishops, and much sooner than the rooks and the queen. – the only piece that can attack a king, queen, bishop or rook without being attacked itself! Each player starts with two rooks, one in each of the corners nearest their own side. In algebraic notation, White’s rooks start on a1 and h1, while Black’s rooks start on a8 and h8. The rook moves horizontally or vertically, forward or back, through any number of unoccupied squares, as in the diagram below. Like other pieces, it captures by occupying the square on which an enemy piece stands. The rook in conjunction with the king can perform a special move called castling. In general, rooks are stronger than bishops or knights and are consequently considered about two pawns greater in value. Winning a rook for a bishop or knight is referred to as winning the exchange. Two rooks are generally considered to be worth slightly more than a queen. Rooks and queens are called heavy pieces or major pieces, as opposed to bishops and knights, which are called minor pieces (see chess piece point value). In the opening, the rooks are undefended by other pieces, so it is usually desirable to unite one’s rooks on the first rank by castling and clearing all pieces except the king and rooks from the first rank. In that position, the rooks protect each other, and can easily move to threaten the most favorable files. A common goal with a rook is to place it on the first rank of an “open” file, i.e. one unobstructed by pawns of either player, or a “half-open” file, i.e. one unobstructed by friendly pawns. From this position, the rook is relatively unexposed to risk but can control every square on the file. If one file is particularly important, a player may advance one rook on it, and move the other behind, doubling the rooks. The King is the most important piece in the game of chess; making it helpless by means of checkmate is the object of the game. If a player’s king is threatened and cannot escape capture, the king is said to be in checkmate, and the player which owns that king loses the game. In a conventional game of chess, White starts with the king in the middle-right of their first rank (between the queen and the king-side bishop). Black starts with the king directly across from the white king. In algebraic notation, the white king starts on e1 and the black king on e8. A king can move one square in any direction (horizontally, vertically, or diagonally). The exception to this rule is that it may not move onto a square that is threatened by an enemy piece. As with most pieces, it captures by moving onto a square occupied by an enemy piece. If none of these three options are possible, the player’s king has been checkmated and the player loses the game. If this happens, the king is said to have been stalemated and the game ends in a draw. A player who has very little or no chance of winning will often try to place the king in stalemate in order to avoid a loss. Together with a rook, the king may make a special move called castling. To castle, the king is moved two squares in the direction of the rook, while the rook is moved to the square the king ‘jumped’ over. The following diagram should help clarify things. There are no pieces between the king and rook. Both the king and the rook stand on their original squares and neither has moved during the game. The king is not in check. The king cannot pass through check, nor into check. The queen is the most powerful piece in the game of chess. Each player starts the game with one queen, placed in the middle of their first rank next to their king. Beginners often accidentally interchange the placement of the queen and king, thus the expression “queen on her color.” The white queen starts on a white square, and the black queen on a black square. In algebraic notation, the white queen starts on d1 and the black queen on d8. 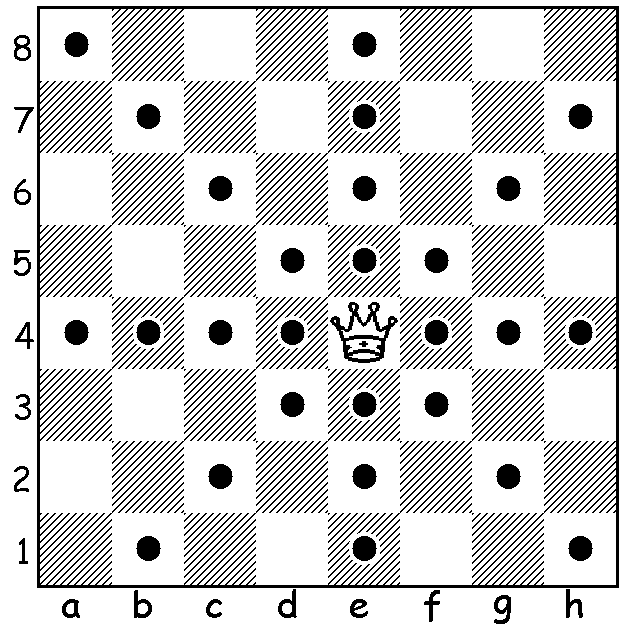 The queen can move in a straight line vertically, horizontally, or diagonally, any number of unoccupied squares as shown on the diagram at below, thus combining the moves of the rook and bishop. Like other pieces, the queen captures by occupying the square on which an enemy piece sits. Ordinarily the queen is slightly more powerful than a rook and a bishop together, while slightly less powerful than two rooks. Because the queen is more valuable than any other piece, it is almost always disadvantageous to exchange the queen for a piece other than the enemy’s queen, unless doing so leads to a position where the king can be checkmated. The queen is at her most powerful when the board is open, when the enemy king is not well-defended, or when there are loose (i.e. undefended) pieces in the enemy camp. Because of her long range and ability to move in more than one direction, the queen is well-equipped to execute forks, but these are only useful if the forked pieces are undefended, or one is undefended and the other is the enemy king. A chess game is drawn if the player in turn to move has no legal move but is not in check. A chess game is drawn if the pieces remaining on the board, such as a lone bishop or knight, are insufficient to force checkmate. If the same position of all forces recurs three times during a game with the same player to move each time, that player may claim a draw. A chess game is drawn if a player demonstrates that he can check without stop and declares his intention to do so. At any time a player may call upon his opponent either to give checkmate or to concede a draw within 50 moves. The count of moves begins anew whenever a pawn moves or there is a capture. The purpose of this rule is to prevent the game continuing indefinitely without any real progress being made by either side on the chessboard. Because of this rule, it is necessary for the aspiring chess player to learn the elementary chess endings. In exceptional (and thus, rare) cases, a player is allowed greater than 50 moves to achieve checkmate. Click here to investigate these positions. A chess game can be drawn if both players agree to it. 1. A player can propose a draw after making a move on the chessboard. He must do so before stopping his own clock and starting his opponent’s clock. An offer at any other time during play is still valid, but Article 12.5 must be considered. No conditions can be attached to the offer. In both cases the offer cannot be withdrawn and remains valid until the opponent accepts it, rejects it orally, rejects it by making a move, or the game is concluded in some other way. The offer of a draw shall be noted by each player on his scoresheet with the symbol (=). In tournament play, when a game in drawn, each player is awarded half a point. A standard set of rules has been established to help chess tournaments run smoothly. The definitive source for tournament regulations is set out by FIDE, the international body of chess. These sections will explain al the regulations you need to know for tournament play. A “chess clock” refers to a clock with two time displays, connected to each other in such a way that only one of them can run at one time. Digital clocks are gaining in popularity, although the older analog clocks are still frequently seen at tournaments. When using a chess clock, each player must make a certain number or all moves in an allotted period of time and/or may be allocated an additional amount of time after each move. All this is specified in advance. The time saved by a player during one period is added to his time available for the next period, except in the “time delay” mode. In the time delay mode both players receive an allotted “main thinking time”. They also receive a “fixed extra time” for every move. The count down of the main time only commences after the fixed time has expired. Provided the player stops his clock before the expiry of the fixed time, the main thinking time does not change, irrespective of the proportion of the fixed time used. In manual clocks, each time display has a “flag”. ‘Flag fall means that all the thinking time has been used up. In tournament play, you usually lose the game if you arrive at the chessboard more than one hour after the scheduled start of the session (unless the rules of the competition specify or the tournament director decides otherwise). During the game each player, having made his move on the chessboard, stops his own clock and start his opponent’s clock. His move is not considered to have been completed until he has done so, unless the made move ends the game. The time between making the move on the chessboard and stopping his own clock and starting his opponent’s clock is regarded as part of the time allotted to the player. A player must stop his clock with the same hand as that with which he made his move. It is forbidden to keep the finger on the button or to “hover” over it. The players must handle the chess clock properly. It is forbidden to punch it forcibly, to pick it up or to knock it over. A flag is considered to have fallen when the arbiter observes the fact or when a valid claim to that effect has been made by either player. If a player does not complete the prescribed number of moves in the allotted time, the game is lost by the player. However, the game is drawn, if the position is such that the opponent cannot checkmate the player by any possible series of legal moves, even with the most unskilled counterplay). If both flags have fallen and it is impossible to establish which flag fell first, the game shall continue. If the game needs to be interrupted, the tournament director shall stop the clocks. A player may stop the clocks in order to seek the tournament director’s assistance. The touch-move rule states simply, that a player who touches a piece must move it. 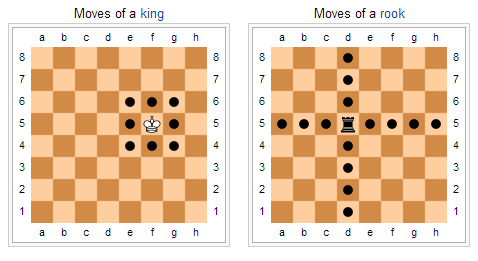 The rule is used in serious competitions and applies only to the player who ihas the move. The player who is not moving may touch pieces, although this is considered poor etiquette. Tournament Director has the right to penalize a player who is touching pieces to annoy or distract the opponent. A similar rule requires that a player who releases a piece after making a legal move is considered to have made that move. A player who moves a piece to a square without releasing the piece is entitled to move that piece to a different square. There is no penalty for a player who touches a piece which has no legal moves. A player who touches an opponent’s piece is required to capture it, if possible. Castling is considered a King move, and a player should touch the King before the Rook. 1. High standards of etiquette are expected of the players. 2. During play the players are forbidden to make use of any notes, sources of information, advice, or to analyse on another chessboard. The scoresheet shall be used only for recording the moves, the times of the clocks, the offer of a draw, and matters relating to a claim. 3. No analysis is permitted in the playing area when play is in progress, whether by players or spectators. Players who have finished their games shall be considered to be spectators. 4. The players are not allowed to leave the “playing venue” without permission from the arbiter. The playing venue is defined as the playing area, rest rooms, refreshment area, area set aside for smoking and other places as designated by the arbiter. The player having the move is not allowed to leave the playing area without permission of the arbiter. 5. It is forbidden to distract or annoy the opponent in any manner whatsoever; this includes the persistent offer of a draw. 6. Infraction of any part of the Articles 12.2 to 12.5 shall lead to penalties in accordance with Article 13.4. 7. The game is lost by a player who persistently refuses to comply with the Laws of Chess. The opponent’s score shall be decided by the arbiter. 8. If both players are found guilty according to Article 12.7, the game shall be declared lost by both players.